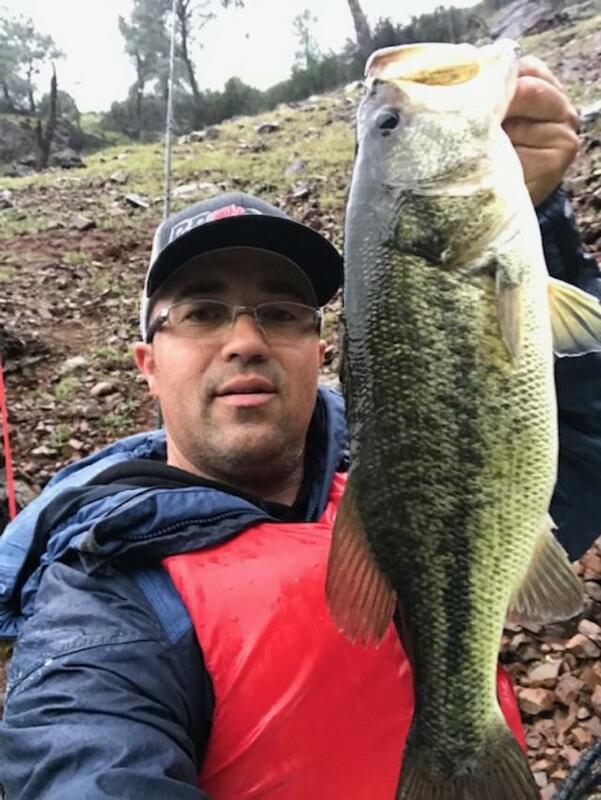 On March 23, 2019, I fished the Motherlode Kayak Angler (MKA) first tournament of the year at Lake McClure. I have never fished the lake before. 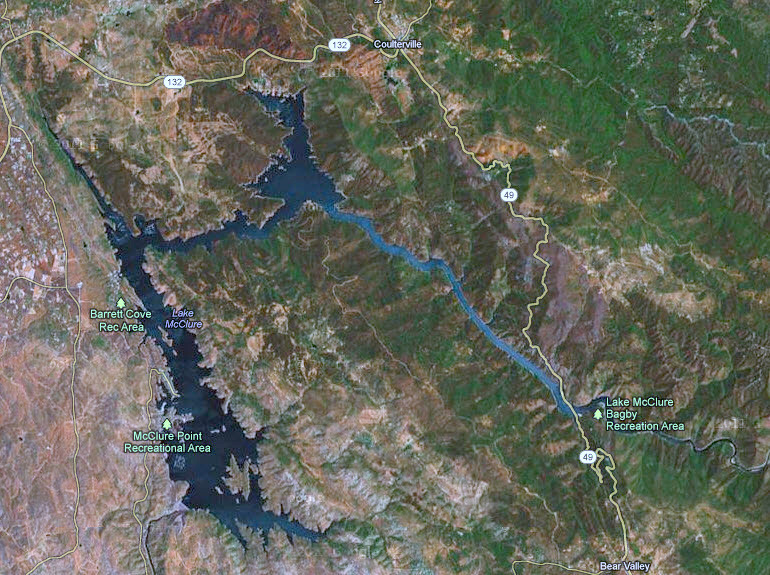 It reminded me of Lake Oroville with the 45 degree angle banks, points, small coves/pockets and limited cover. The lake has a lot of spotted bass and a decent largemouth bass population. During practice I went looking for bed fish. The water temperature was pushing 60 degrees and the water was clear. I peddled my Hobie Outback south to the Temperance and Cotton Arms searching protected coves that should hold bed fish. All the spawning beds were empty. I backed off to deeper water and fished the points that lead into those coves. I caught several fish on the points and a few in the creek channels around 15 to 20 feet deep. None of those fish were longer than 13 inches. I started to head north up the West bank fishing a dart head, shaky head and a senko with a nail weight. I was catching about one fish every other point and pocket I fished, just nothing of any size. I switched to a 3.3” Keitech Swing Impact FAT Swimbait in Electric Shad, on a 3/16 oz. 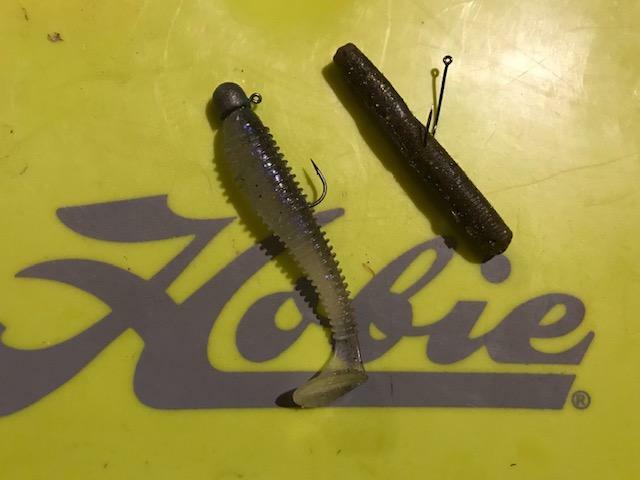 worm nose jig head. I started to catch more fish and better quality fish. I let the bait fall to the bottom and reel it in slow. Most of the time they would hit it all the fall. I continued north and ended up east of Piney Creek behind some house boats. I found a waterfall that had about a dozen bass at the bottom of it. 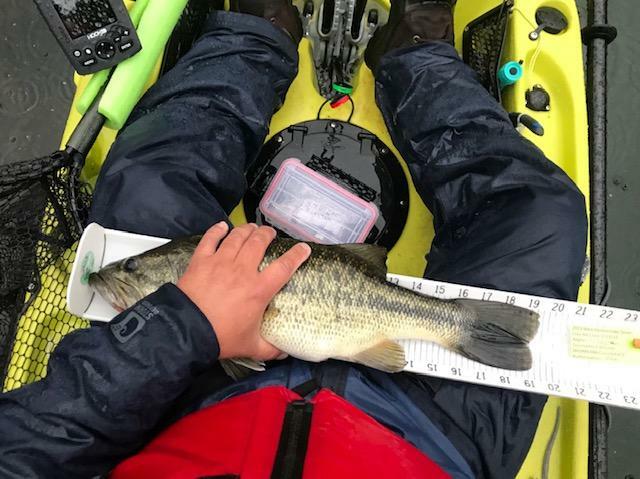 One of the bass was the biggest bass I’ve seen all of practice, and that was going to be where I would start the tournament. The day of the tournament I went to the waterfall and on the my second cast I caught a 19 1/4 inch largemouth on a wacky rigged homemade ned bait. Unfortunately that was the only fish I caught at the waterfall. The rest of the tournament I threw the Keitech and caught what seemed to be fish after fish. My three fish limit consisted of a 14 3/4 inch and 15 inch spotted bass and the 19 1/4 inch largemouth for a total of 49 inches. Good enough for 6th place and a check. I talked to some of the anglers that finished in the top 5. They said they caught their fish on under spins and ned rigs. Lake McClure has a very healthy population of bass and is a fun lake to fish. The lake fishes like Lake Oroville and you can catch a ton of fish in a day. I will definitely be coming back to Lake McClure again in the near future. Please practice CPR (Catch, Photo, Release).